Painting Stripes on Walls – Are You Up for the Challenge? 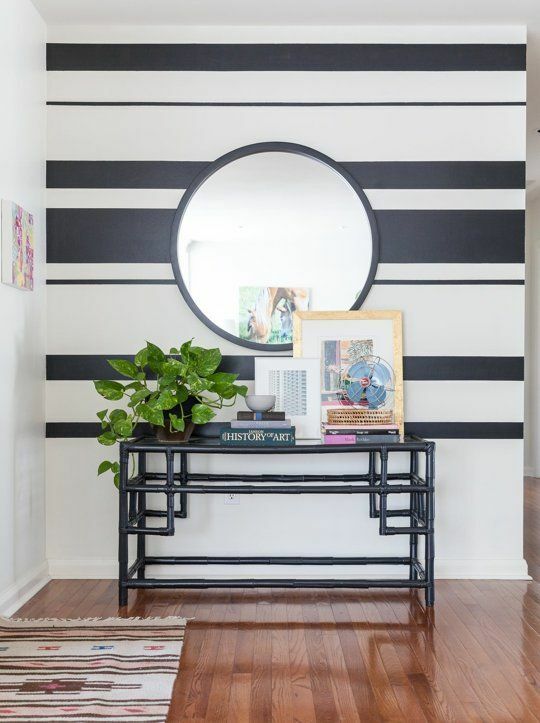 Painting Stripes on Walls - Are You Up for the Challenge? Painting stripes on walls can makeover the look, style, size, shape and even feel of a room. A friend of mine had a very boring apartment in an expensive part of town. 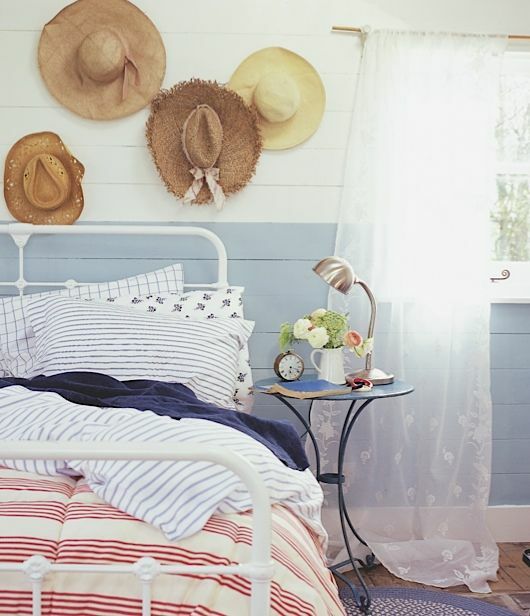 Thick soft pale blue and ivory painted striped walls in the bedroom changed all of that. It gave the room a luxurious and expensive feel that set it apart. This post has tips and guidelines on choosing the right paint colors, stripe direction and stripe width to take your home decorating to the next level using this simple painting technique. Striped walls are not as popular because they became fairly common. But use them well, use them with a twist and they can be more effective than tiles or expensive wallpaper. Let's start with color. Color is very important when it comes to painting stripes on walls. Your goal is to create contrast between the two colors you have selected for impact to create a timeless look. Your contrast can range all the way from subtle to deeply intense. A lot will depend on your personal taste, your home and your home decorating. Choosing wall stripes in shades of the same color, within 1-2 shades, is a safe classic choice that is difficult to get wrong. Using light, subtle color combinations are understated and elegant. Rooms feel spacious, especially if you use horizontal stripes. Deep contrasting color combinations character and add high drama. They can also make rooms feel smaller and more enclosed because they remove natural light. 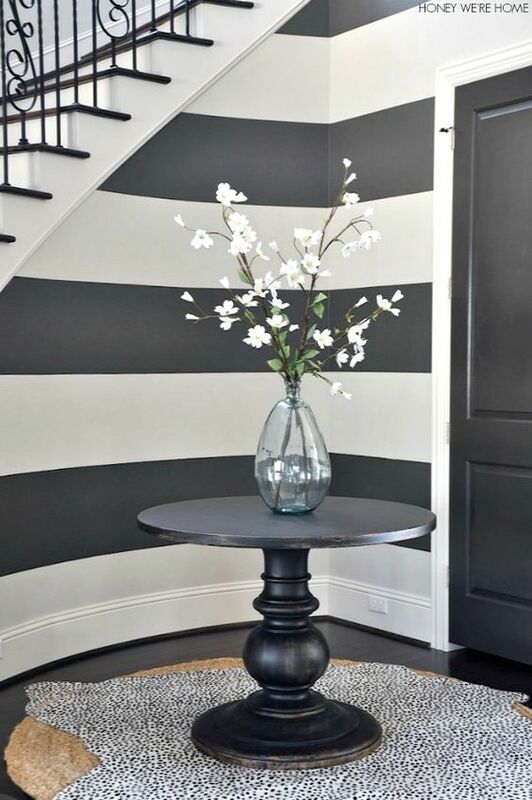 The greater the color contrast between stripe colors (for example black with white), the more dramatic the statement. High contrasting colors can make rooms feel smaller, but they work very well as feature or accent walls. Think of an entry, chair rail or fireplace. 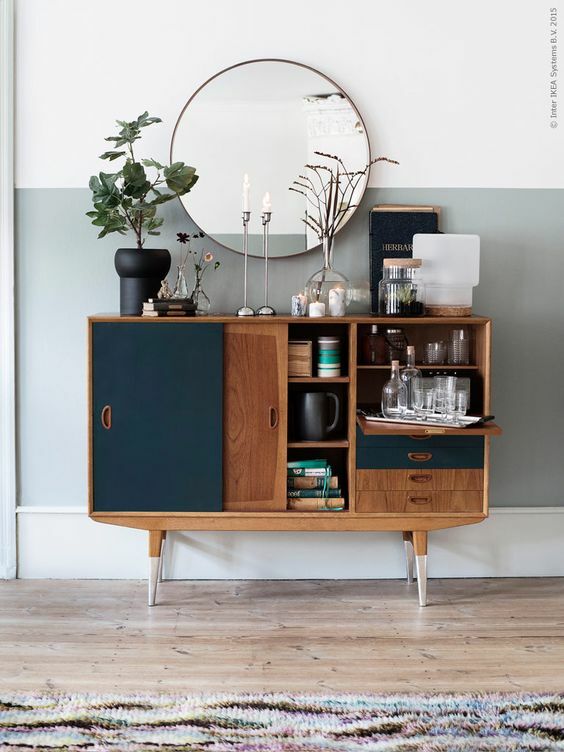 Gray and white, and black and white are still the most popular for painting stripes on walls but I think deep emerald-green or sea green with white or ivory would make a great combination, and of course, baby blue/gray or deep navy with ivory. The deeper colors if you want drama and the softer shades if you want a subtle peaceful room. There are a lot of tutorials showing you how to create perfectly edged stripes, so I won't go into the details here. But the finish is as important as the color, stripe width or direction. You want a crisp even finish at all times, prepare before you start painting stripes on walls. If you have open living spaces and would like to create visual divides between different living area, painting striped walls can section off areas. You don't need to paint a large area to make a difference. The pattern interrupt will make the area feel larger and more interesting. Want to change your room's dimensions? Painting stripes on walls horizontally or vertically gives you instant results. 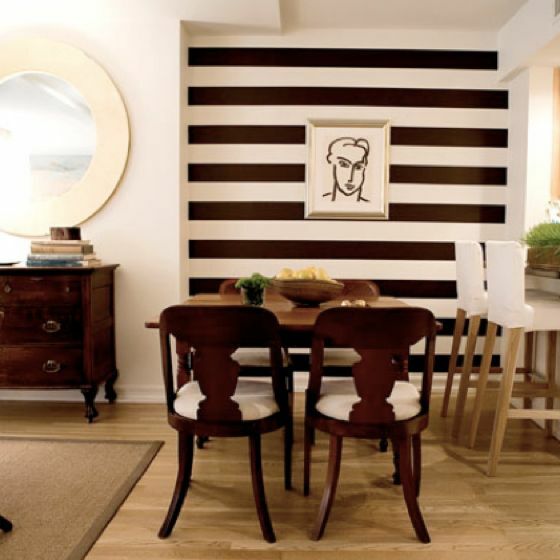 Vertical wall stripes are perfect for small boxy rooms with low ceilings. Vertical stripes make rooms feel taller without raising your ceiling, especially when you use a narrow to medium-sized stripes. Horizontal wall stripes trick your eye, making rooms feel wider and bigger and the ceiling lower. Diagonal wall stripes create the illusion of movement and work well as feature walls or in small sections. How Wide Are Your Wall Stripes? The width of stripes can add to the effect you want to create. Let's start with traditional vertical stripes. The most common width for vertical stripes is 6 inches. If you are not sure what size to use, start here. Very wide, column stripes work well in rooms with very high ceilings. Narrow pinstripes look chic. These work best on accent or feature walls, as they can look too busy if used on all four walls. Mixing it up with different stripe widths looks modern and contemporary. Your baseboard and crown moldings become bookends to your wall pattern, so don't forget to consider them in your design. Horizontal stripes have traditionally been 12 inches wide minimum. Often, the wider the better, reducing the number of stripes and your workload. 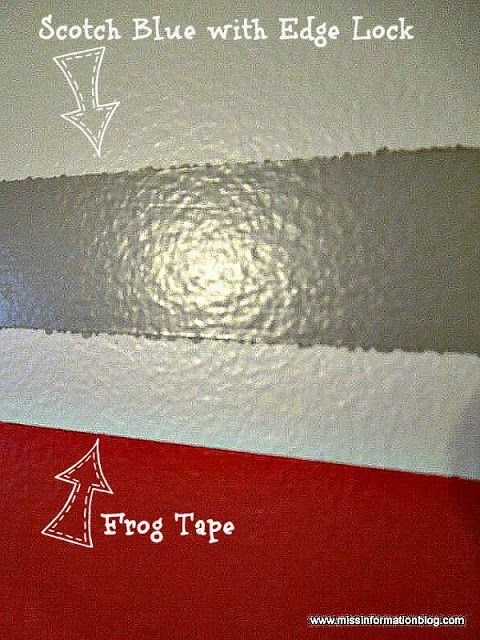 Just 2 stripes on your walls can be enough to change the look of your room completely. While painting horizontal stripes on a wall with equal sized stripes are classic, you can add 2 or more different widths. The more widths, the more modern your room will look. 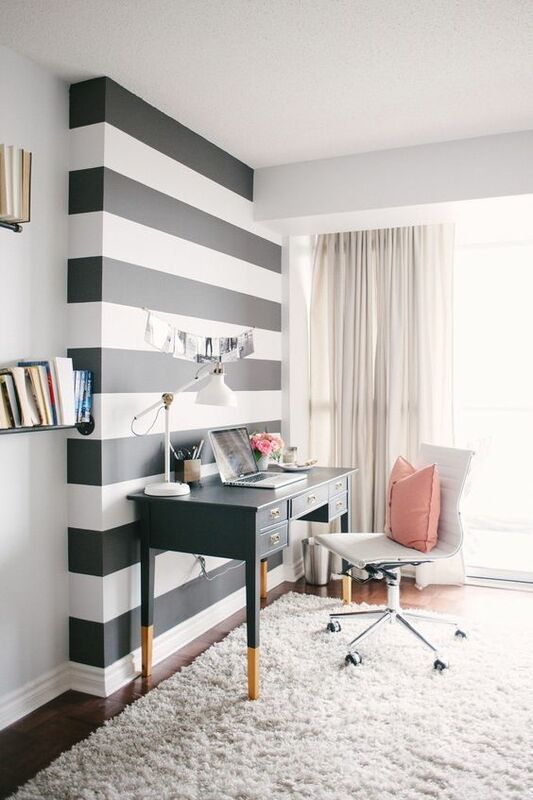 Once you have designed and decided on a pattern, you can create your striped walls quite quickly. Using classic gray or black and white color combination, in an elegant design, looks crisp, dramatic and modern but it also looks expensive and elaborate. This look would cost more to create in tiles or wallpaper. If you love thinking and creating outside the box, then consider adding another dimension to the look of your stripes, by using different paint types or paint sheen types. You can use the same color, but try two different finishes like satin or gloss, or flat and satin. This will create an understated, subtle effect and an elegant play on color. 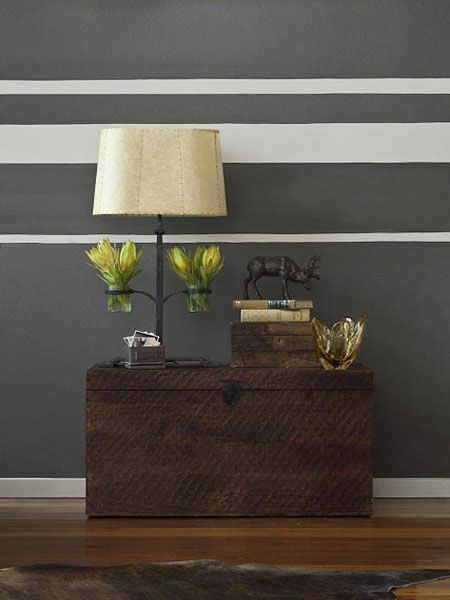 Why not create your stripes in matte and metallic finishes for a more modern rustic look? Let me know if you have played with these wall stripe ideas, I'd love to hear about your successes.